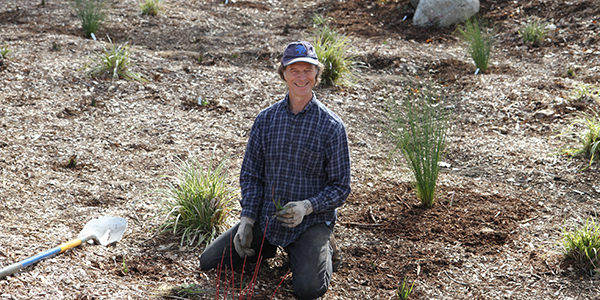 Charles Rogers adds plants to the Redwood Campus rain garden. As Oregonians, we deeply understand the value of our environment and how precious clean water is. 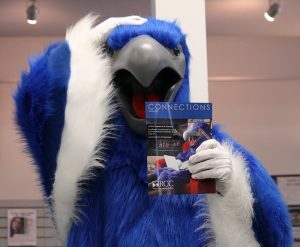 That’s why Rogue Community College (RCC) and Sustainable Rogue Valley have teamed up on a demonstration rain garden and bioswale on the Redwood Campus to show how to help prevent stormwater pollution from fouling freshwater ecosystems. The rain garden gathers rainwater runoff from hard manmade surfaces such as parking lots and roads and filters it through a bioswale, using unique wetland plants and organic matter. 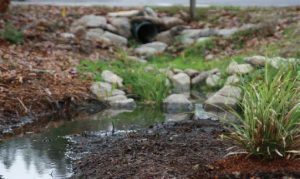 The bioswale acts as a sponge to hold and break down pollutants while allowing naturally filtered water to seep into the ground or enter natural drainage systems. The result is a lovely garden that also provides a vital function in the watershed. Signs are posted on-site to explain the project and how it works. “We hope this demonstration site will inspire others to build rain gardens and bioswales to improve water quality and beautify the landscape,” says Charles Rogers, the RCC science instructor managing the project. The rain garden is located next to the Josephine Building at 3345 Redwood Highway in Grants Pass. The Oregon Watershed Enhancement Board provided the funding to construct the drainage basin and fill it with mulch. The Williams Creek Watershed Council completed that stage during summer 2017. Additional funding provided by the RCC Foundation and the Ashland Food Co-op covered the costs of plants and other materials to complete the rain garden. Sustainable Rogue Valley is dedicated to fostering sustainable practices through community service and education. Individuals and local groups interested in planting, shaping and maintaining this active demonstration project can visit www.sustainableroguevalley.org for more information or email Charles Rogers at crogers@roguecc.edu.